Over the past month, analysts at the Ostrogorski Centre have discussed the rise of the Belarusian defence industry, the increase in dialogue between European and Belarusian parliamentarians, and prospects of real student self-government in Belarusian universities. The analysts extensively commented in media on the challenges of Belarus’s strategy to balance between Russia and the EU, ripening changes in the Belarusian political and economic model, trends in the Belarusian arms trade and defence sector, Belarusian-Russian relations after Ukraine conflict, and other issues. Siarhei Bohdan argues that the Belarusian national defence industry, which emerged in the 1990’s as a helpless fragment of Soviet arms industries, evolved to become a significant branch of the Belarusian economy. This happened also because of the rise of the private sector and diversification of its markets and partners. These products, including anti-tank rockets, optics, electronics, and missiles, have not only found a market abroad, they have also contributed to national military capacities. Moreover, the development of this branch can set an example for other industries, especially with regard to the incremental development of the private sector and diversification of international ties. Igar Gubarevich discusses why the marginalised Belarusian parliament has been slowly gaining international recognition. The eagerness of several European national legislatures to re-establish contacts with the Belarusian parliament seems to lack a logical explanation, and no convincing attempt to provide one has been made so far. The increased contacts of European parliamentarians with their Belarusian “counterparts” have no positive impact on development of democracy in Belarus or promoting the national interests of the EU countries concerned. Meanwhile, such collaboration helps strengthen the international position of the Belarusian government. Ryhor Astapenia analyses the preparation of a new Education Code, which the authorities are amending partly to demonstrate to the West that they are making changes. In 2015, Belarus joined the Bologna process and is now required to reform the education system accordingly. The new code should state directly that student government will be autonomous and free from guidance by university administration. Moreover, unions should obtain legal status, as this will allow them to obtain funding from outside the university. 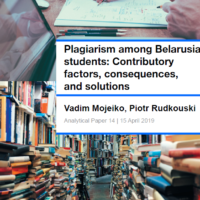 However, even if the law changes, Belarusian authorities also need to change their behaviour towards student groups. They should stop the persecution of independent youth organisations and student unions with whom they collaborate. Igar Gubarevich met with Tana de Zulueta, the Head of the OSCE/ODIHR Election Observation Mission at the 2016 parliamentary elections in Belarus, and Stefan Szwed, the Mission’s political analyst. The international observers took interest in Igar’s expert opinion on the current political situation in Belarus in the context of the forthcoming parliamentary elections. The analyst shared his insights on eventual implications of this event for Belarus’s foreign policy and specifically the country’s relations with the European Union. Siarhei Bohdan in the program “Prague accent” on Radio Liberty discusses whether the transformation of independent Belarus into an authoritarian state was inevitable. Despite all the negative aspects of Lukashenka’s authoritarian system, it allowed an independent Belarusian state to be built and maintained. However, in order to ensure a peaceful transfer of power during the end of authoritarianism, Belarusian authorities need to gradually introduce a pluralist and democratic model. Ryhor Astapenia discusses recent political developments on Polish Radio. Despite statements from Aliaksandr Lukashenka on growing cooperation with China and the successful Palanez rocket launcher project, trade figures paint a different picture – export to China in the first half of 2016 fell 5 times compared to 2015. Ryhor believes that the decision of authorities to grant oppositional candidates for MP air time on TV will not significantly influence public opinion. Yaraslau Kryvoi elaborates on the challenges of Belarus’s strategy to balance between Russia and the EU on Polish radio. Belarus tries to find a sustainable way to balance its main economic partner Russia with its counterweight the EU. Belarus is deeply entangled in Russia’s economic, political and media sphere, so any radical divergence could cause Russia to use force against Belarus. The West should not fear Belarus as it rearms and modernises its army, because it does so only protect its own sovereignty. Yaraslau Kryvoi also analyses the ripening changes in the Belarusian political and economic model. Many officials responsible for economic policy come from the new generation, some with western education and experience of work in the private sector. The security camp remains more conservative and loyal to Russia, but they also understand that security forces should care about the state’s real problems rather than combat imaginary NATO threats or persecute the Belarusian opposition. Siarhei Bohdan discusses trends in the Belarusian arms trade and defence sector. Belarus is no longer on the list of the world’s top ten arms traders. It had previously got to the top simply by selling a large number of Soviet military jets at once. On the other hand, arms production is developing rapidly in Belarus, as it managed to produce its own finished arms manufacture. Surprisingly, the private sector has played a major role in this success. Ryhor Astapenia discusses his recent paper “Belarusian-Russian relations after Ukraine conflict” on Polish radio. Although Belarus has been distancing itself from Russia since the Ukraine crisis, it cannot get out of the integration projects with Russia, such as the Eurasian Economic Union, CSTO and the Union State. Perhaps the distancing will continue, but Belarus will never cross the red line. Regarding relations with the EU, Belarus only normalises relations rather than build an alliance, and cooperation in the political and military sphere remains low. Ryhor Astapenia comments on recent political developments in Belarus on the “Political mirror” programme on Polish Radio. 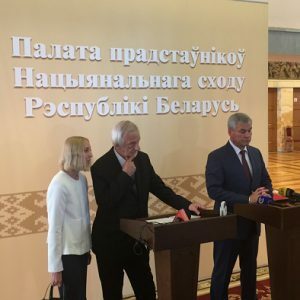 Suspension of the work of IISEPS in Belarus is a black day for Belarusian analytics, as it was the only organisation conducting polls every three months. The fact that Alieś Lahviniec was denied registration shows that authorities do not want to lose control of the election campaign. The number of members of opposition parties in the election commissions indicates that the elections will take place without any surprises. The BelarusProfile.com database now includes the following people: Paviel Bielavus, Ihar Tyškievič, Aliaksandr Žuk, Ihar Karpienka, Ivan Naskievič, Eduard Paĺčys, Andrej Jeŭdačenka, Viktar Prakapienia, Uladzimir Vasiĺka, Barys Chrustalioŭ. We have also updated the profiles of Valiancin Šajeŭ, Aliaksandr Michnievič, Uladzimir Niakliajeŭ, Paviel Šaramiet, Viktar Pierapialica, Siarhiej Parsiukievič, Kiryl Rudy, Siarhiej Navumčyk, Marjana Ščotkina, Aliaksandr Jakabson, Paviel Jakubovič, Aliaksiej Janukievič, Aliaksandr Jarašuk, Jaŭhien Baskin, Kanstancin Bandarenka.